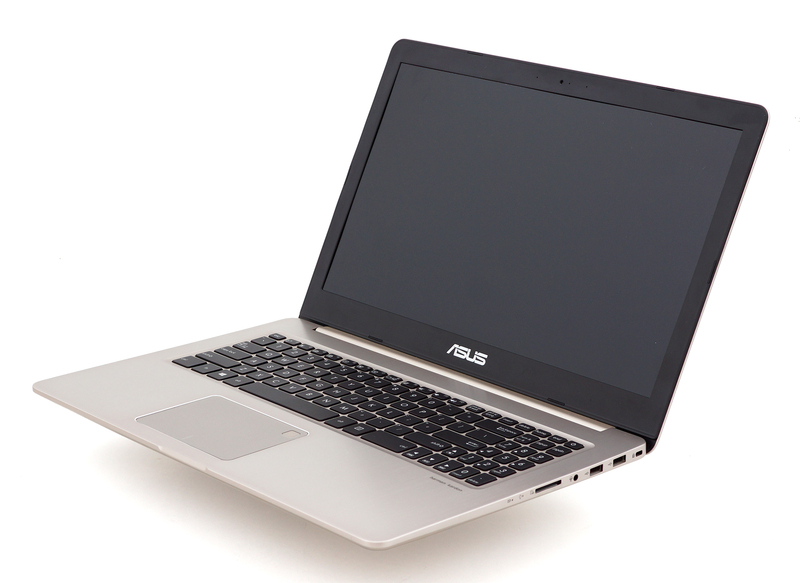 The N-series from ASUS has long been praised for their balanced hardware (maybe the CPU is a bit of an overkill but still…), excellent multimedia properties (good screen and high-quality audio) and now, the VivoBook Pro 15 N580VD needs to prove itself as a worthy successor to the N552VX. And in most cases, the laptop stands out, although it fails to impress in some other key areas like noise emissions and battery life. Luckily, the new N580VD keeps what’s good from the previous generation but boasts the latest hardware currently from NVIDIA and Intel on board in a much slimmer and tinier chassis. 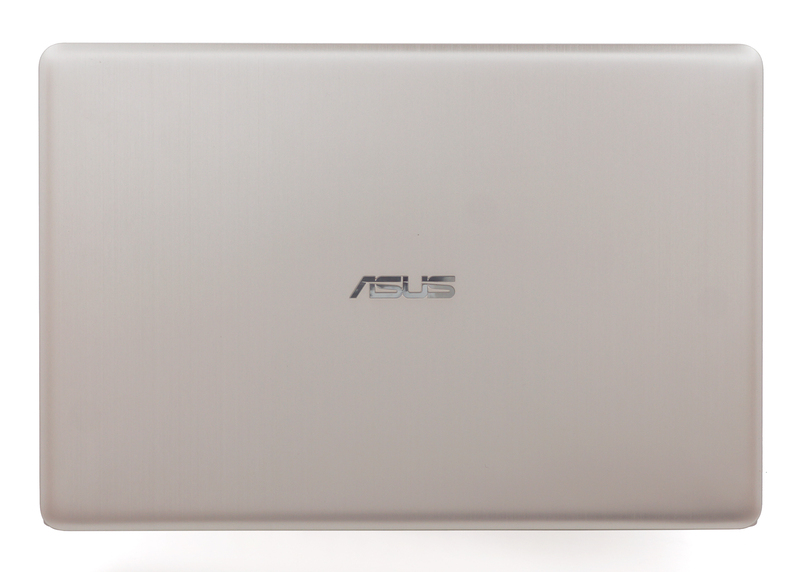 Dimensions and weight were always a considerable drawback with the N-series and now with the new addition to the lineup, ASUS aims to fix that. However, we have some concerns about cooling performance and battery life. Usually, smaller chassis limit the cooling performance and can’t hold a decently-sized battery. We hope the Core i7-7700HQ and the GeForce GTX 1050 will run cool under load. The notebook comes in a small box containing all the usual stuff – AC adapter, power cord, user manuals and a cable tie. As we already stated, the N580VD has gone through some major changes with the most noticeable ones being the weight and dimensions. 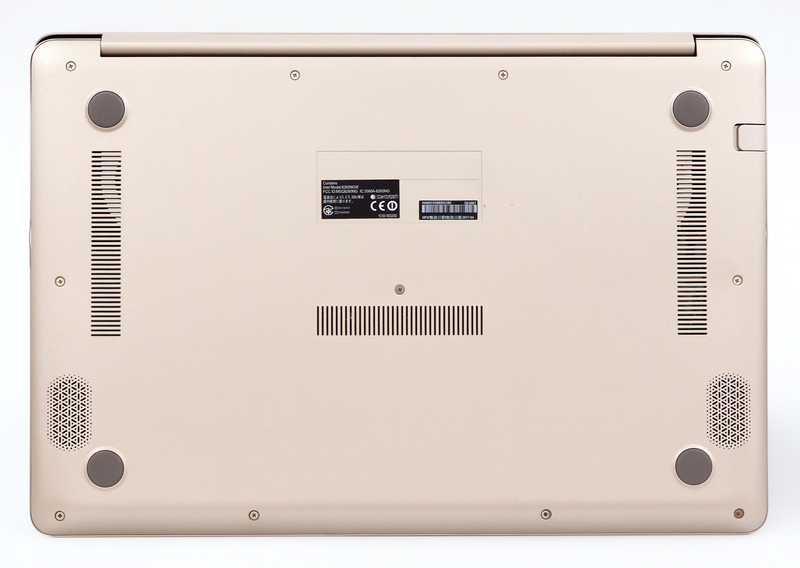 Now sporting a smaller overall case, the N580VD can be called “portable”. In fact, the laptop is surprisingly lightweight tipping the scale at just 1.85 kg and measuring just above 19 mm in height (19.2 mm to be exact). In addition, the case now incorporates more aluminum than plastic and retains the general sturdiness of the device. Oh, and the bottom piece now matches the color of the interior and exterior and thus, it’s more aesthetically pleasing than the previous two generations. The lid – it’s still made of brushed aluminum but the concentric circles are missing this time around. 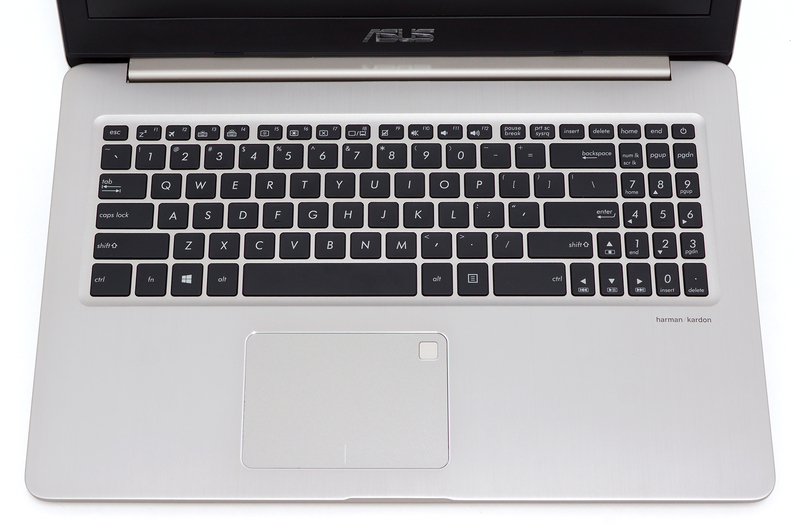 We kind of miss them – that’s one of the distinctive features of some of the ASUS laptops. Anyway, pressing the center of the lid results in slight bending but nothing too serious about it. On the other hand, we found it to be quite prone to twisting probably due to the thin plastic bezels that support the screen. As for the single hinge design, it appears to be well-made providing smooth travel and allows opening the device with just one hand. Still, we noticed some minor sways when touching the screen, which might be problematic for the touch-enabled version. Moving to the bottom, we find a plastic surface imitating anodized aluminum matching the lid and interior. There are three small grills for cool air intake and two openings for the stereo loudspeakers. As we go around the sides, we see more than we could ask for in terms of connectivity from a 15-inch device. The left side houses the DC charging port, RJ-45 for LAN, USB 3.0, full-sized HDMI and a USB-C 3.1 (Gen 1) also supporting a display output. This one comes as a substitute to the mini DisplayPort found on the previous generation. And as for the right side, it accommodates two more USB-A 2.0 connectors (we wish one of them was 3.0) a 3.5 mm audio jack and an SD card reader. Opening the laptop reveals clean and simplistic looks as usual. 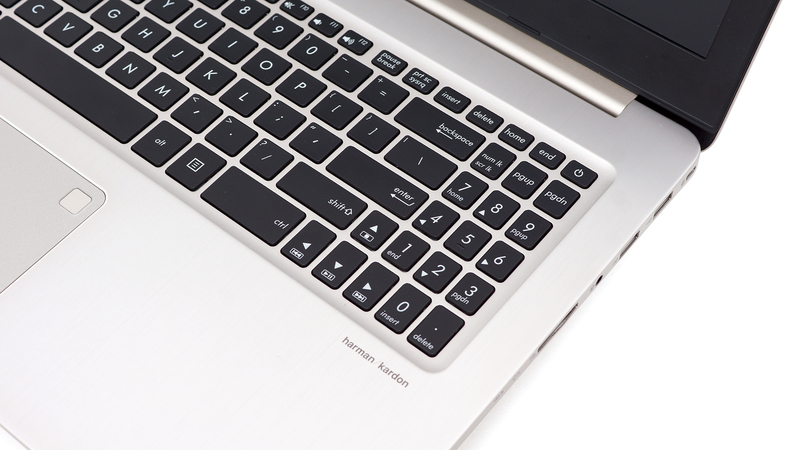 The material is swapped with brushed metal surface and machined edges around the clickpad. Unfortunately, though, despite being made of aluminum, the interior still flexes in the upper part of the keyboard and near the spacebar. It won’t be a deal-breaker for most users but the previous generation felt a little bit sturdier in this regard. Moreover, the keyboard feels like a small downgrade too. Don’t get us wrong though, it offers nice and clicky tactile feedback, discreet LED illumination and well-spaced keys but the long key travel and big Numpad block will definitely be missed. The arrow and the Numpad keys are so small and crammed up that they feel a bit awkward to use. 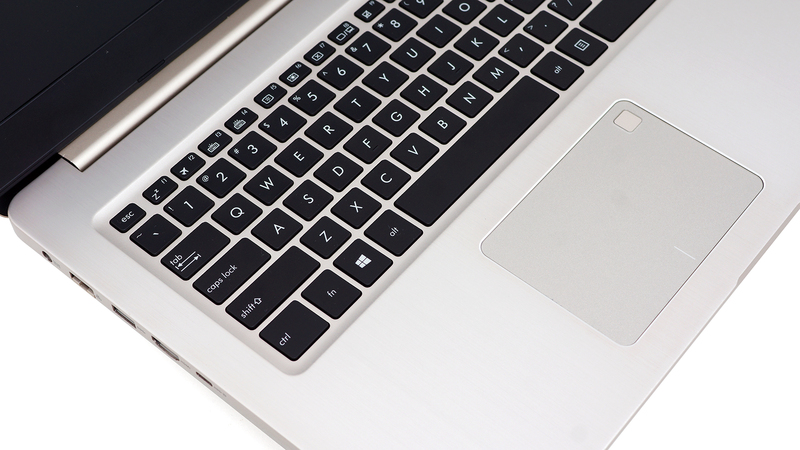 Fortunately, the clickpad remains stable, responsive, clicky and features a smooth gliding surface. We can definitely say that the new VivoBook has proven itself as a worthy successor to the multimedia N-series and for the first time, we see significant changes in the overall design resulting in increased portability while retaining fairly stable construction. The disassembly process of the notebook is pretty easy as long as you know how to detach the bottom piece. Just remove all the screws at the bottom and try prying it up with a thin plastic tool at the back where the vents are placed. That’s where the plate detaches much easier. As usual, the laptop comes with a standard 2.5-inch HDD and an M.2 PCIe NVMe-enabled SSD slot. 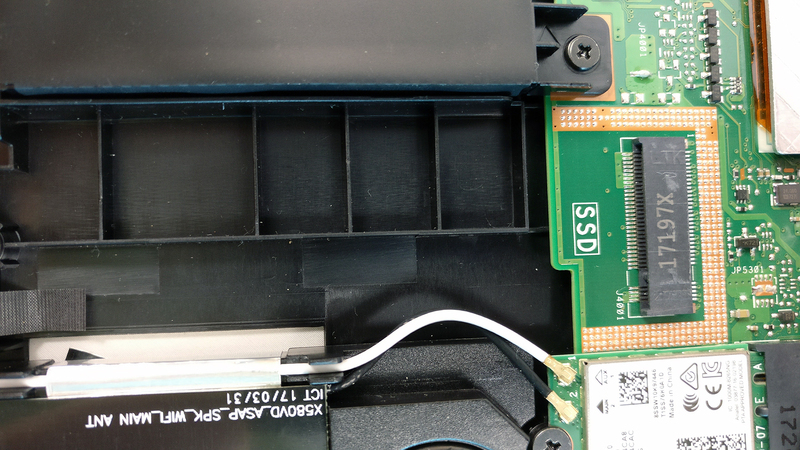 The latter is empty in our reviewed unit but the 2.5-inch bay was secured by Seagate 1TB HDD. 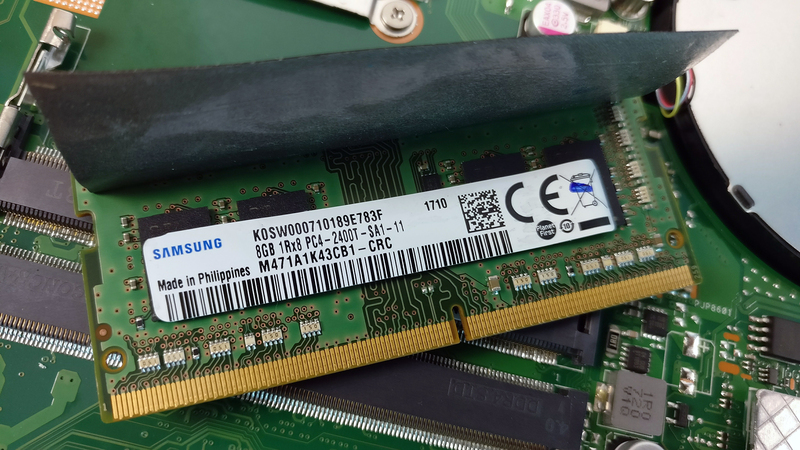 As expected, the motherboard supports two memory slots, one of which in our case was taken by a Samsung 8GB DDR4-2400 stick. 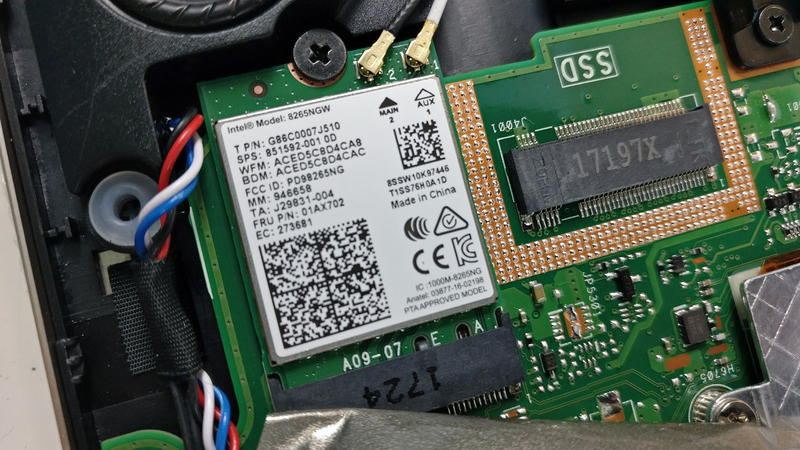 The Wi-Fi adapter can be found near the M.2 SSD slot and it’s Intel 8265NGW. 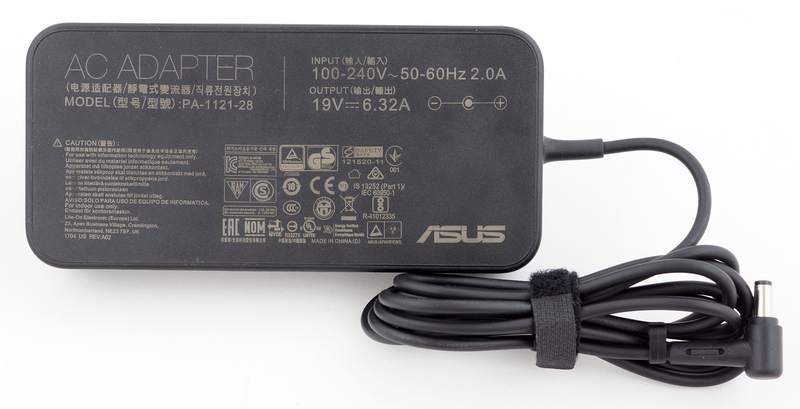 The battery is rather small – rated at just 47Wh, it’s not that effective with the given energy-sipping hardware. The cooling system is pretty simple and uses a familiar design for powerful notebooks – two separated cooling fans and two big heat pipes going across the heat sinks. 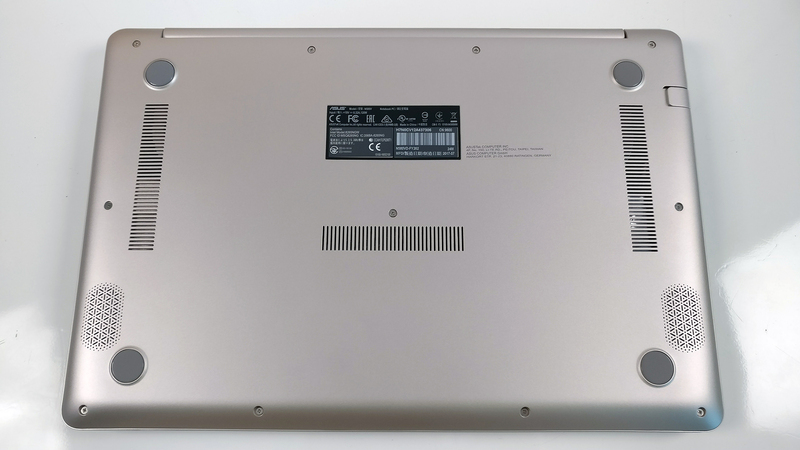 The notebook uses a Full HD (1920×1080) IPS panel from LG with model number LP156WF6-SPP2. At 15.6-inch diagonal, the pixel density is 142 ppi while the pixel pitch is 0.18 x 0.18 mm. The screen can be considered as “Retina” when viewed from a distance equal or greater than 60 cm. We’ve measured a maximum brightness of 313 cd/m2 in the middle and 283 cd/m2 as average across the surface with maximum deviation of 19%, which is a bit high to our standards. The color temperature at maximum brightness on white screen is 7430K, which means that colors will appear colder than they should. Moving along the grayscale, the color temperature moves a little closer to the optimal (6500K) – 7330K. You can see how these values change at 63% brightness (141 cd/m2). The maximum color deviation dE2000 compared to the center of the screen at 63% brightness is 5.2. 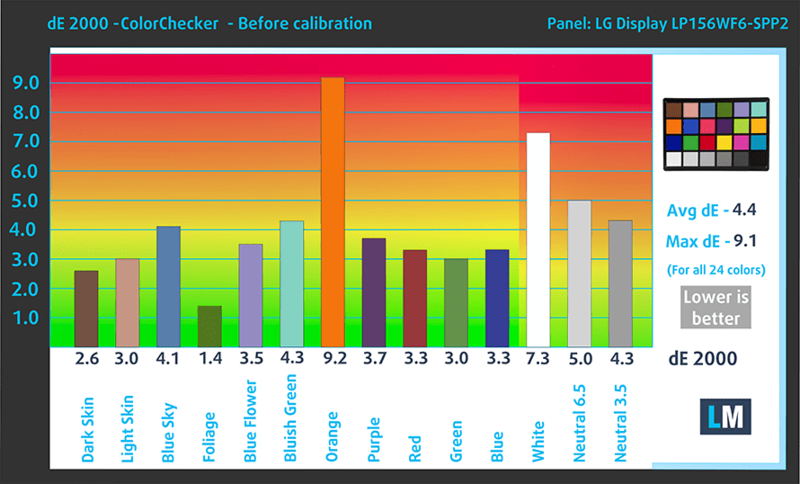 Usually anything above 4.0 is considered high deviation, especially when color-sensitive work is involved. The contrast ratio is good – 1010:1. Our tests show that the screen covers 87% of the sRGB, which is pretty much on par with the competition at this price range and will be enough for multimedia and gaming. Unfortunately, the panel uses high-frequency PWM for regulating screen brightness. However, only users with sensitive eyes might feel the effects at 21 kHz and if you are one of those users, we suggest using our Health-Guard profile that eliminates PWM. 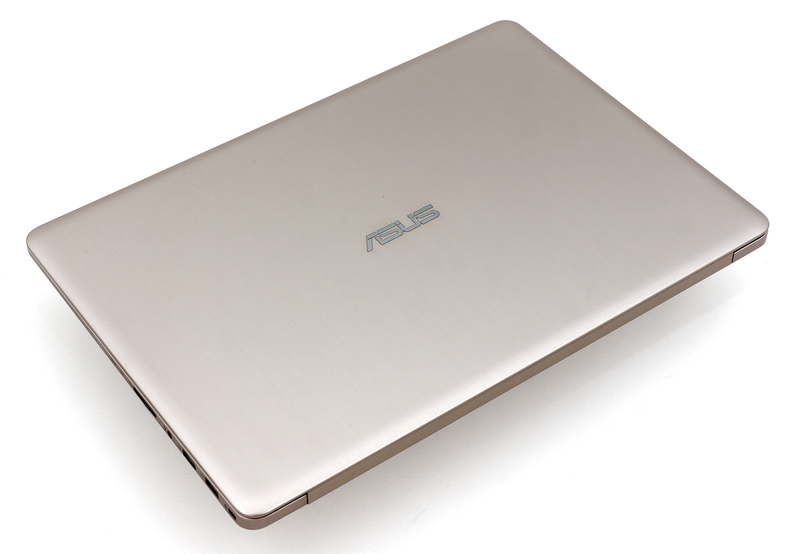 The ASUS N-series have never disappointed us in terms of image quality and the VivoBook N580VD delivered what we’ve expected as well. Yes, sure, the panel could have been a little bit brighter but the contrast ratio is good and the sRGB coverage is more than decent. 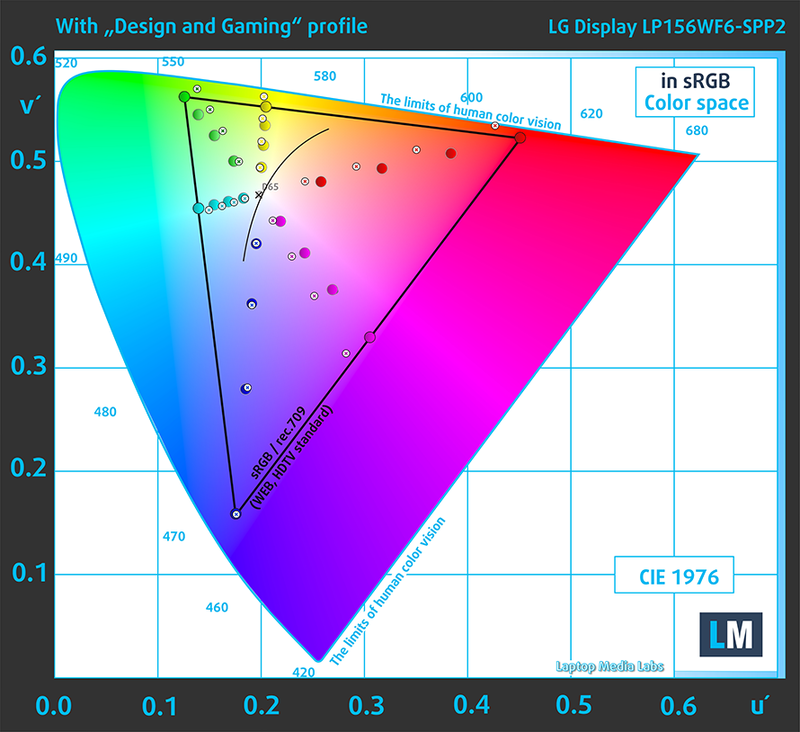 Our only serious complaint would be the color deviation out of the box and the PWM used for regulating luminance. Our “Design and Gaming” profile, however, will fix the color deviation and the “Health-Guard” profile will take care of the PWM. The sound quality on this thing is amazing. The clarity and the fullness in the low, mid and high frequencies is just outstanding and enough to call the VivoBook N580VD an excellent all-round multimedia device. 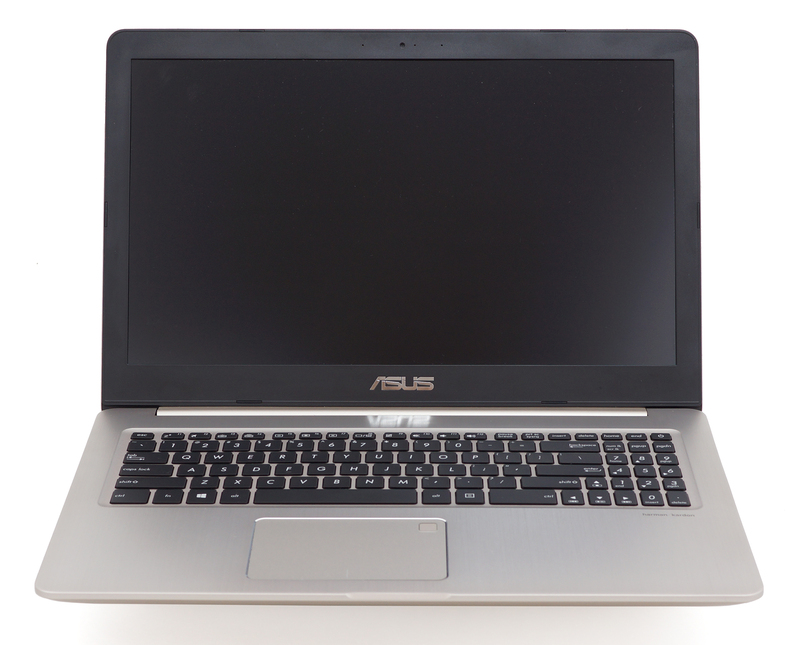 We used a fresh install of the Windows 10 OS for the writing of this review and if you wish to do the same, we suggest downloading all of the latest drivers from ASUS’ official website. We didn’t expect any record-breaking results from the VivoBook N580VD due to its high-voltage CPU, energy-sipping Full HD IPS panel and fairly low battery capacity – just 47Wh. 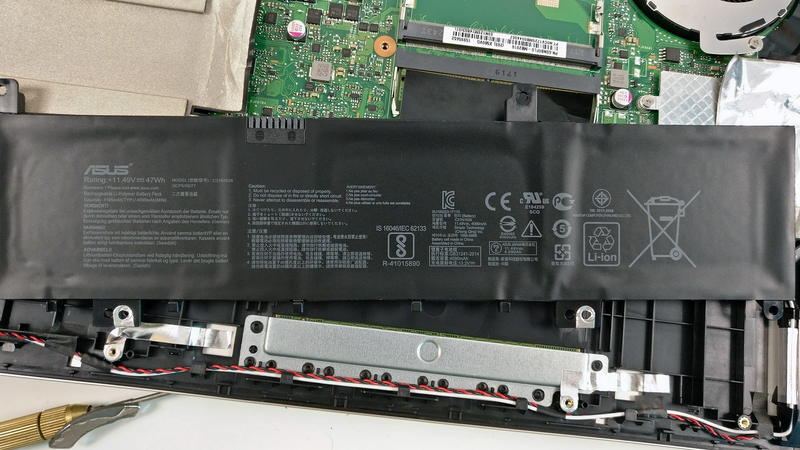 However, the results from our web browsing and video playback tests show just about average battery endurance considering the price range and the purpose of the laptop. All tests, of course, were run with the same settings as always – Wi-Fi constantly running, screen brightness set to 120 cd/m2 and Windows power saving feature turned on. Pretty average result here – 326 minutes (5 hours and 26 minutes). Interestingly, a bit higher than expected result – 372 minutes (6 hours and 12 minute). Of course, the laptop isn’t made for gaming away from the power source but it’s good to know that it can handle heavy workload a little over an hour – 86 minutes (1 hour1 and 26 minutes). Here you can see an approximate comparison between the CPUs that can be found in the ASUS VivoBook Pro 15 N580 models on the market. This way you can decide for yourself which ASUS VivoBook Pro 15 N580 model is the best bang for your buck. Here you can see an approximate comparison between the GPUs that can be found in the ASUS VivoBook Pro 15 N580 models on the market. This way you can decide for yourself which ASUS VivoBook Pro 15 N580 model is the best bang for your buck. All stress tests that we perform can’t be taken as a representation of real-life use since 100% CPU + 100% GPU load for nearly two hours is virtually impossible in real-world scenarios but it remains as the most effective way to assess the overall stability and effectiveness of the cooling system, especially in the long run. We kicked things off with 100% CPU load for about an hour – the Core i7-7700HQ ran at fairly decent temperatures while utilizing the maximum clock speeds for four active cores (3.5 GHz) for a while but then slowly went down to around 3.1 GHz, which is still within the Turbo Boost range. 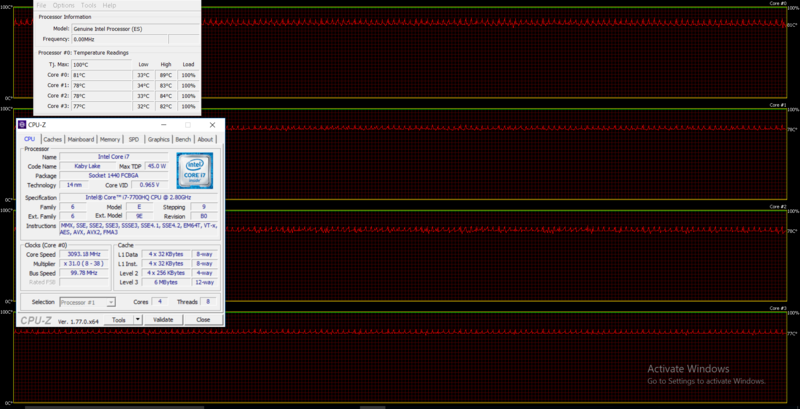 Switching on the GPU stress test didn’t result in throttling at all. The CPU clocked down to near base operating frequency – 2.9 GHz, while the GTX 1050 ran at more than its maximum potential – 1582 MHz. Inner temperatures were a bit high but this is rather normal considering the nature of the torture test. We’ve also measured how warm the surface gets during these stress tests. The only “hot” area was above the center of the keyboard where the main exhaust vents are placed. Also, the middle section of the keyboard was rather warm but more importantly, the palm rest area was cool throughout the whole test. We can definitely conclude that the cooling design does its job really well considering the powerful hardware and thin chassis. In all other areas, the VivoBook Pro N580VD excels – it has the looks without sacrificing rigidity, it’s pretty portable and lightweight, it has a decent amount of I/O and the input devices are great. Compared to some GTX 1050-powered alternatives on the market, the laptop is slightly pricier but you pay for the better build quality and overall better IPS display. Yet, if you are willing to settle for the Core i5-7300HQ, which doesn’t make any difference compared to the Core i7-7700HQ when it comes to gaming, this machine is a bang for the bucks. Also, the sound quality is ideal for your daily multimedia needs. And finally, the cooling system appears to handle the hardware pretty well, especially when you take into account the thin and light chassis. Our extreme stress test shows that the cooling design should be reliable in the long run as well. And although battery life is improved compared to the previous generation, it definitely isn’t something to be proud of. There aren’t many powerful multimedia solutions at this price range that we can think of so we might as well compare it to other GTX 1050-powered notebooks, which happen to be gaming-oriented. The Acer Aspire VX 15 and the Lenovo Legion Y520 are right up there but to our surprise, the VivoBook N580VD seem to beat them all in terms of efficiency, image quality and portability. I’m trying to get a machine with IPS display, here in Bulgaria, but I fail to find such. All of the listed N580VDs seems to be TN versions. Is there some code/number with which I can differentiate the IPS from the TN model? No, they are not. I can confirm at first hand that the units in Bulgaria are shipped with FHD IPS displays. The one we reviewed is one of them. 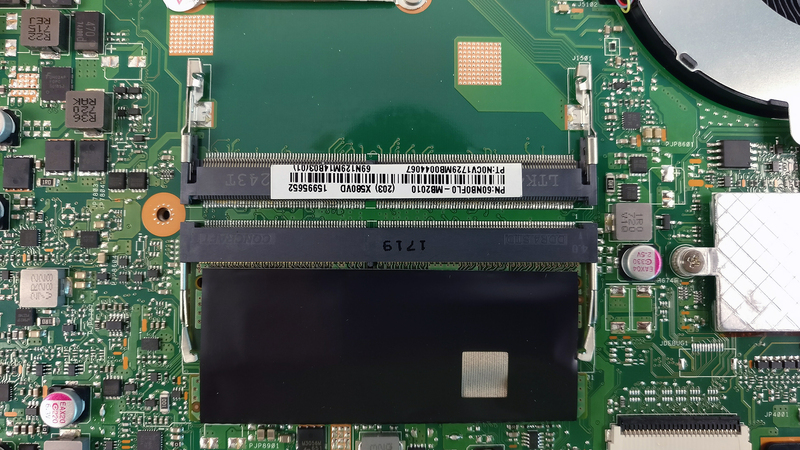 Did you test the SSD slot using NVME SSD type? Some reviewers have said that the slot can’t support NVME. We tried it personally, it works. So there are possibility that buying an 960 or 970 NVME SSD it will work without any issue?!? Thanks for the reply! I am interested to buy one in the coming weeks, especially in n580vd-dm160. On some of the review sites it’s says that this version allows a maximum of 32gb of RAM (16gb on each slot). But the online stores says that the maximum is 16gb. Do you know what is the maximum, or maybe what type of motherboard this laptop uses? Hi. I own an Asus n580vd with LP156WF6-SPP2 display. I use it for photo editing (not-professional level), I have no external monitor right now. Is one of these color profiles suitable for this task? And if yes, which one? 4K resolution on the MacBook Pro 15? I don’t think there is such. Thanks! I was wondering what was the most accurate in colors. Do you have any insights about dual boot this machine with Ubuntu? Very nice review through which I discovered your work on profiles–very interesting too. I’m considering buying this laptop and I’m wondering whether you know if upgrading the disk to an SSD (either by replacing the HDD or by installing an NVMe one) would void the warranty. Thanks in advance! You probably won’t but it depends on your retailer. Ask him before you buy. Can i use it for heavy programms like solidworks, programming and multitasking? Also, im currently stucked between this one, the dell g3(heavy) or the lenovo ideapad 330 15-ich. (maybe old) which do you think is best? im an engineering student.